Dentures and partials are removable prosthetic devices that can be taken out of the mouth. They are constructed to replace many teeth. They support themselves partly on the gum and underlying bone, and in part on the remaining teeth if there are any. 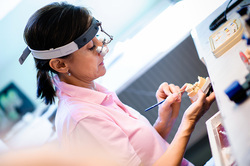 Crowns and bridges are the most frequently used fixed restorations. A crown is recommended to entirely cover a damaged tooth that is beyond repair with a filling, inlay or onlay. Crowns are usually placed over damaged, fractured, discolored, and root canal treated teeth. A bridge makes it possible to replace a lost tooth without the use of a denture or dental implant. A bridge can be cemented onto natural teeth or implant abutments. Dental inlays and onlays are a medium between dental crowns and fillings implicated on teeth at the back of the mouth that has suffered a moderate level of decay. Veneer is a shell or a thin layer of tooth-colored restorative material placed over the facial surfaces of one’s teeth, to correct worn tooth enamel, uneven tooth alignment or spacing, discoloration and chips or cracks.